Kos . Found in the village of Kefalos (territory of Isthmos). Now in the small storage room of the Castle. Opistographic stele of white marble with a kymation, reused as part of a Byzantine capital and inscribed with the letter Β on each side. Measurements given with the kymation at the top of the stele. Letters: 1.1 cm high; space between lines: 0.5 cm high. Edition here based on Hallof - Bosnakis IG XII.4 100. Other edition: Pugliese Carratelli 1963-1964: 161-163 no. VI, with ph. figs. 2 and 3. Further bibliograhpy: Van Straten 1995; Bosnakis - Hallof 2005; Parker 2008a; Paul 2013a; Kató 2013. The organisation of the decree and its rules is not completely clear. Lines 7-15 are particularly murky. Lines 15-21 codify the appointment of the ἀρχεύων—the same name was employed for the chief magistrate of a tribe on Kos, cf. CGRN 145, line 1, for the Elpanoridai at Halasarna—who is to be in charge of Aristokreon's bequest; this man is to be in charge of putting on a feast (lines 21-24). There follow elaborate rules against misusing the money of the donation and, appropriately, also the rendering of accounts by the ἀρχεύων (lines 24-38). Cultic prescriptions make an appearance with the provisions of a sacrificial animal and the arrangement of a torch-race for boys by the ἀρχεύων (lines 38-43, perhaps continued to line 48). The remainder of the regulations (lines 49ff.) is difficult to interpret (see below). Lines 4-5: The deme of Isthmos was situated at the extreme west of the island of Kos, whose cult centre was ancient Astypalaia. The three tribes, the Theadai, the Kyniadai and the Melainadai, are known only from this inscription. On the local tribes at Isthmos, cf. Pugliese Carratelli, p. 153-154. Paul, p. 289 argues that the celebration of cults on the level of the tribes was an important aspect of the religious life in the Koan demes. On the cults of Isthmos, more generally cf. Paul, p. 221-236; for other regulations from the deme of Isthmos, see here CGRN 101. Lines 6-11: It seems that Aristokreon had perhaps proposed a detailed proposition concerning the use of his money (if the restoration προαίρεσις, lines 6-7, is correct). Possibly this plan involved making a "correction" to or a "redressing" of the rites of the deme and its tribes (διορθ̣ώ̣σασ[θαι, line 9), returning to a form of worship that was (previously?) 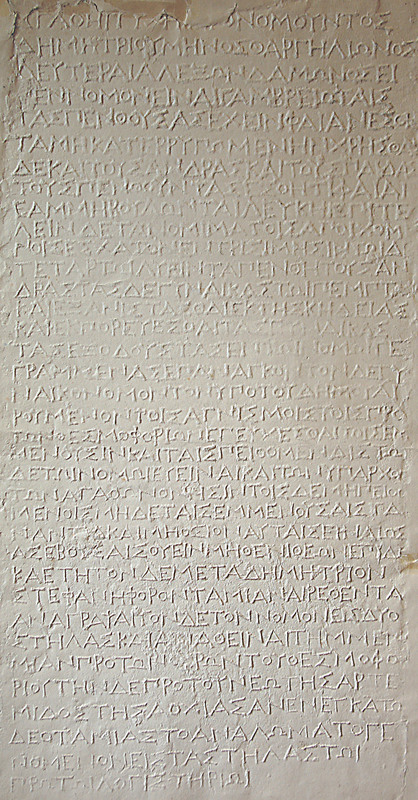 normative (τος ἐννόμος, line 10) and was described in the written heritage (κατὰ τὰ γεγραμμένα, line 11). Note that it is uncommon for references to "what is written" to mention the author, as seems to be the case here (ὑπό, line 11). Lines 15-21: The procedure for the selection of a chief magistrate is described. His tasks seem to have included the organisation of the sacrifices, holding a reception or feast, and taking care of the administration finances of the donation. The office of the archeuon in connection with cultic activities is known from various Koan inscriptions: IG XII.4 103; 110; 456; 586; and see above. Here, each chief magistrate was to choose his successor. In practical terms, this may have entailed that the magistracy would often remain within the same family or social circle (Kató, p. 286-287). The chosen person will have the possibility to refuse and to make a suggestion for replacement. In such a situation, the demarch should organize a democratic vote; the responsibility will devolve to the one who collects most of the votes. Lines 21-24: The "reception" to be held by the chief magistrate seemingly coincided with the conclusion of the magistracy, since the accounts concerning the use of the money should be rendered on the day following this occasion. Hyakinthios was a summer month, the second month of the estival semester in the city of Kos (June/July, cf. Bosnakis - Hallof). Lines 24-29: This part of the decree is aimed at preventing misuse of the dedicated money. The fine, 1000 drachmae, is high and would have had a strong preventive effect, as would the reward for the informer (half the amount, i.e. 500 dr.). Lines 30-38: Since the chief magistrate needed to render an account concerning the use of the funds from the donation (again, lines 23-24), the final authority for the payment of rewards and the imposition of fines seems to have rested with the demarch, who would act in this capacity probably during an official meeting of the tribes (line 30). At this meeting, the chief magistrate would also be present, in order to immediately include the new financial information into his accounts (lines 31-32). The precise reason for the voting processes which are then mentioned elude us, as does the payment of fifth and tenth parts (lines 32-35). After the account was rendered, the demarch himself was subject to fines if he did not make payments as stipulated (lines 36-38). Lines 38-43: These lines mention the provision of a he-goat by the chief magistrate to the boys of the deme, an occasion which also included a torch-race. Paul (p. 232) mentions that in the same month as the reception mentioned earlier (lines 21-24 above), namely Hyakinthios, the festival of the Hermaia is attested in the city of Kos. During this celebration, there was perhaps a torch race for boys and a prata, which was a preliminary individual torch-race (cf. Paul, p. 131-133, for further explanation and references). inscription refers to the same celebrations. The λημνίσκος, a woollen fillet, is sometimes specified in ritual norms, and was used as an adornment for sacrificial animals (here, for the he-goat); cf. here CGRN 45 (Athens) and CGRN 146 (Phyxa), line 16; on the comparable στέμμα mentioned at e.g. CGRN 64 (Epidauros), line 6, van Straten (p. 162) explained that it could be hung over the horns or around the belly of the animal. Lines 46-65: The prescriptions in side B are relatively difficult to decipher. A sacrifice and the celebration of a festival near the end of the month Hyakinthios is again mentioned (lines 46-48): this was probably the major ritual occasion that was concerned by Aristokleon's donation, occurring soon after the "reception" mentioned in lines 21-24. One particularly intriguing clauses occurs in lines 49-53 (? ), where the appointment and selection of epimenioi is mentioned. This seems to have occurred early in Agrianios, the month preceding Hyakinthios: this would thus seem to represent the appointment of subsidiary officials in time to assist the chief magistrate in organising the sacrifices funded by the donation. The month Agrianios was also the month in which the magistrates of the summer-semester would start their magistracy in the city of Kos; it is possible to hypothesise that three epimenioi were appointed, one from each tribe (see lines 52-53). On the role of epimenioi as temporary officials responsible for a festival, who are occasionally particularly conspicuous in familial endowments, see here CGRN 104 (Halikarnassos), lines 23-31, and CGRN 185 (Lampsakos), line 28; for epimenioi on Kos, see also CGRN 147, Face B. The sense of lines 53-60 cannot be deciphered with certainty. The dedication of 1000 drachmae to the Theoi Patroioi of the three tribes occured in side A (lines 26-27) and there concerned the consecration of a fine; it may be that lines 55-56 represent a similar circumstance. The final preserved lines (60-65) were apparently concerned with some financial arrangement, the meaning of which remains elusive. CGRN 197, l. x-x (http://cgrn.philo.ulg.ac.be/file/197/). <bibl type="author_date" n="Kató 2013">Kató 2013</bibl>.